The Therm-a-Rest NeoAir UberLite is a super comfortable and lightweight sleeping pad that only weighs 8.8 oz. It's packs up very small and is suitable for warm weather use. 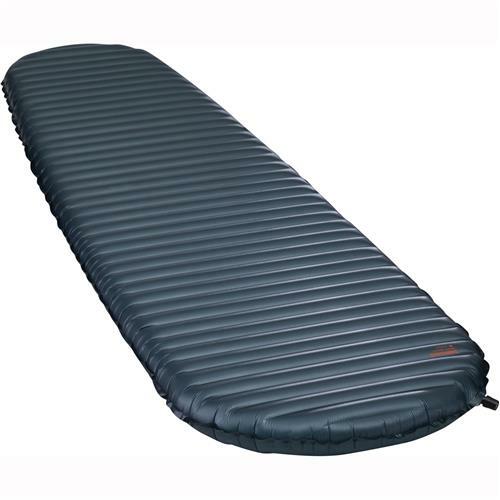 The Therm-a-Rest NeoAir UberLite Sleeping Pad, weighing 8.8 oz is currently the lightest weight full-sized inflatable sleeping pad available today. With an R-value of 2.0, it’s suitable for use by ultralight backpackers and thru-hikers in warm weather, above 40-50 degree F, although you can extend its temperature range by stacking it on a closed cell foam pad. While the UberLite looks like Therm-a-Rest’s three season NeoAir XLite and four season NeoAir XTherm sleeping pads, it’s made with lighter weight fabric and less insulation to save weight. While this does reduce its durability, the UberLite is also the quietest and least crinkly sounding sleeping pad in the NeoAir product family. That fact alone, may make it worth upgrading to for existing XLite and XTherm owners who want a lighter weight summer sleeping pad. The NeoAir UberLite is available in three different lengths and widths: a 47 x 20″ small size weighing just 6 oz, a 72 x 20″ regular size weighing 8.8 oz, and a 77 x 25″ long and wide size that weighs 12 ounces. Depending on your preferences and goals, all three sizes are pretty attractive in terms of weight and comfort. Perhaps even more impressive, is the fact that many of the UberLite pads shipping now are even lighter weight than their spec. For example, the regular 72″ sized pad that I’ve been using only weighs 8.2 ounces, which is 0.6 ounce below the official published product weight. The thin plastic air chambers inside a Therm-a-Rest NeoAir UberLite Sleeping Pad. 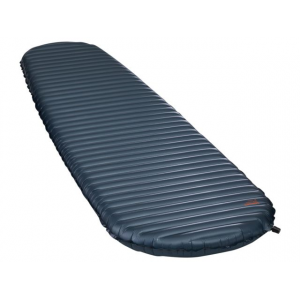 The NeoAir UberLite and its popular sibling, the NeoAir XLite Sleeping Pad are almost identical in design. They have the same dimensions and the same tried and true Therm-a-Rest stick valve. Both pads’ baffles are oriented horizontally and the sides are welded shut. Both pads are also treated with a fungicide to prevent mold from growing inside when you blow them up by mouth. The biggest difference between the two pads is the weight of the exterior fabric used and the insulation they contain. The UberLite is made with a 15 denier nylon top and bottom, while the heavier XLite is made with a 30 denier high tenacity ripstop nylon, making it more durable and puncture resistant. While the UberLite is made with a lighter weight fabric, I haven’t experienced any durability issues it. But like any piece of ultralight gear, you do need to respect it by avoiding contact with rough surfaces including pointed sticks and stones, gravel, and splinter-rich shelter floors. I always put some kind of liner under an inflatable sleeping pad to protect it, be it a tent floor, a piece of window wrap, or a bivy sack. The UberLite also has less insulation than the XLite, which explains why it has an R-Value of 2.0 vs. the XLite’s R-Value of 3.2. The crinkly aluminum lining that Therm-a-Rest uses in the XLite and the cold-weather NeoAir XTherm pads has been removed in the UberLite. With an R-Value of 2.0, the UberLite is about 25% less insulating than a foam pad like the Therm-a-Rest Zlite (R Value = 2.6) in its ability to insulate your body from the ground. That’s not much insulation and you could be shooting yourself in the foot if you switch to the UberLite. In fact, the best way to use the UberLite might be in combination with a thin foam pad like a Gossamer Gear Thinlight (1/4″ or 1/8″ thick ) or a Therm-a-Rest Zlite in order to combine the comfort it offers with the increased insulation provided by the foam. It takes me about 30 breathes to blow a regular 72″ NeoAir UberLite up. The UberLite is scored into thirds so that it folds up compactly when deflated. I usually roll mine up once to get all the air out, and then a second time to roll it up along the thirds to make it as small as possible before packing it away. The Therm-a-Rest UberLite is a cool sleeping pad, in more ways than one, and I’m sure a lot of ultralight backpackers will buy it because it’s so lightweight. However, with an R-Value of 2, it’s important to understand that the UberLite doesn’t have enough insulation for use in cooler spring or autumn weather unless you augment it with a foam pad to bring up its R-Value. If you backpack and camp in three season weather and can only afford to buy one NeoAir pad, you’d be better off buying a 72″ Therm-a-Rest NeoAir XLite (R-Value = 3.2). It’s less expensive and a better value for that purpose. It’s ancient history now, but Big Agnes came out with a full size air mattress called the AXL Sleeping Pad in 2018 (link to review), which weighs just 0.8 ounces more than the UberLite. Big Agnes doesn’t publish R-values for this pad today, although they’ll likely be forced to next year when the new sleeping pad R-value standard rolls out. I mention this pad because it is more comfortable than the NeoAir UberLite, less expensive, and even quieter to sleep on. Disclosure: The author received a pad from Therm-a-Rest for this review. A $180 dollar float for the pool? Seriously, a one season pad. Thanks for keeping it real Philip. Yeah, good review. Bluntly, the Uber is all about comfort. Light weight means it is comfortable while carrying. And the thick 2.5 inches means it is comfortable to sleep on. Of greater concern to me, is the thin material used for the upper and bottom of the pad. As you say, it needs to be protected from normal ground stuff: rocks, sticks, etc. I worry that it will fail rather easily in comparison to the thicker 30D fabrics in use on the XLite. I have already worn one XLite out in about three years (170 nights.) It was leaking in multiple locations along the bottom indicating a simple “worn out” condition. The older NeoAir original lasted much longer(around 7 years) and weighed only one ounce more. At close to $200, I do not consider the pads to be “disposable” in any way. They just seem to wear out rather quickly. For most of my camping/hiking, the NeoAir pads are a comfort item. I always bring a 5 layer NightLite pad as my main pad (R2.7,) and usually use it under my NeoAirs. (It doubles as a frame for my packs.) So, if they do leak, it is certainly possible to go without. But, I will need to think about a new purchase of an Uber. The durability starts to look pretty poor. The overall Rvalue for the Uber system (R4.7) is reasonable for spring and fall. I carry my primary anyway, so I don’t worry about loss of R1.2 so much. But, as a UL hiker, even in shoulder seasons, I appreciate the comfort of having a light pack. The Uber would help with that. Yeah, I hear that. The older NightLites/Luna’s were better than the Zrests, though…at least they feel warmer to me. In another article (the interview with MSR regarding warmth ratings of quilts), you mentioned that determination of sleeping bag temperature ratings assumes an R-4 pad. So, as you also said in that article, a pad with a lower rating (like the Uberlite) could also mean that your quilt/bag may not perform down to its limits. It can be used as a modular sleep pad system for thru hikers or shorter summer thru hikers. For example, an AT hiker could start off with the Uber and a foam pad during the cold months, ship the foam forward and use only the Uber during the summer months, then add the foam back for September and October or as needed. That way, you’d be reducing several ounces over several months and be equivalent to Xlite weight while carrying foam and Uber. Yes, but… if the inflatable is made of thin delicate material, and you aren’t using a reasonably tough ground sheet, soon you might be sleeping on the rocks in summer, even if you carry the repair kit (mandatory, I would think). Besides, if you use a frameless pack, what else are you going to use to hold the pack in shape? I talked with a gentleman who uses a hammock but carries a z lite pad in case he has to go to the ground. He also uses it in his hammock to boost his UQ. He was looking forward to using an Uber lite instead. Philip, do you ever use a pad in your hammock? Only a foam pad on occasion. Great review, thank you! I see you have dissected Uberlite. So internal chamber walls are not mylar, correct? Could you make bigger photo of internals around welds? I have some experience with inflatable + foam combinations, here is my two cents. First about Thinlight pads… I have 1/8″ version… Maximum R-value it can have is around 0.5 (just based on thickness and typical foam properties). But it compresses under pressure, so in use it will be less R-s… Probably it will not add significant warmth. Zlite+Uberlite will work, but there will be problem with sliding, you will need straps… And thin&light straps will not work (they will not stay in place, also you can cut both Zlite and Uberlite with thin strap). I’ve used webbing belts from Columbia Silver Ridge pants as straps in similar setup, they are 1″ wide and around 22g weight each (you need two, so add 40-50g to setup). Also for comfort (and less sliding) I suggest Zlite ON TOP of Uberlite. And one more setup to consider. Thermarest has Zshield pad, it looks good candidate to be used under Uberlite. Zshield is 72×24″ size (four inch wider then Zlite, yes you can trim it if you want) and 377g actual weight (Regular Zlite is 403g). Zshield is less sleek than Zlite, so sliding may be less problem (and some silicone strips on Zshield could help). Total R-value will be 1.5+2.0, which is warmer than men’s Xlite. I just bought the uberlite and have been using it on the floor with my down bag. Feels really flimsy to me. Have used a Zpad for years, but am tired of sore hips on the granite. I really don’t want to worry about my pad popping every night and I’m not a fan of blowing up my pad nightly either. Right now, I’m considering going heavier with the Sea to Summit UltraLight Insulated pad. It’s 15oz(which is an ounce more than my Zpad), but uses a air stream stuff sack pump which blows up in about 2 pumps and deflates in seconds without having to do an initial roll out. I’m thinking after about a month on the trail, I’m going to enjoy not blowing and deflating daily. Also, StS pads seem more durable(hence the extra weight). Anybody care to comment about this or have experience with the StS UltraLight? Past NeoAir pads are extremely durable. I’ve never had a problem with mine and I’ve been using the same XLite and XTherm for years. Time will tell with the Uberlite. I’ve done a detailed review of the StS Ultralight uninsulated in the past and I expect it will answer some of your questions. A great pad and STS makes good products.